It was Saturday night and I was looking for pretty much any excuse to not go to the gym and started thinking that I really hadn’t eaten lunch, and since it was already almost dinner time I should probably buckle down and come up with something (leaving no time for the gym). I peeked in the fridge and wasn’t really inspired by anything. Then I remembered a promise I made myself a few weeks ago to start using more cookbooks. I have a bunch of them, some really good ones too, but for some reason when I’m looking for meal inspiration I always start with the internet and my most trusted blogs/recipe sites. So I sat down on the floor in front of my cookbooks and started browsing (this browsing had nothing to do with looking for an excuse to not go to the gym). I have a few cookbooks marked with sticky notes for things I want to try but still, nothing was calling to me. Finally I pulled out a 5 year old copy of Cooking Light magazine that I impulsively bought at the check out counter but had never actually used. I took one look at the picture on the cover and instantly remembered why I had impulsively bought it. At the time I saw the picture, thought it looked amazing, threw it down on the conveyor and didn’t think twice. 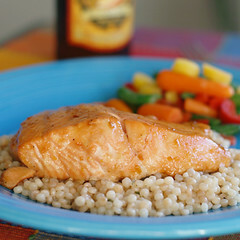 When I got home I opened the magazine and read the title of the recipe “Pineapple and Teriyaki Glazed Salmon”. Ick! What had I been thinking, I don’t mix fruit flavors with savory dishes. Well since that day I have expanded my palate by leaps and bounds. While I still don’t think I’ll be having pork chops and applesauce or eating a big hunk of apple pie, I am no longer afraid of a slightly sweet tang to my savory dishes. So it was decided. I ran to Trader Joe’s and picked up the things I needed. Can I just tell you how much I am kicking myself for not having made this dish sooner? It was amazing. 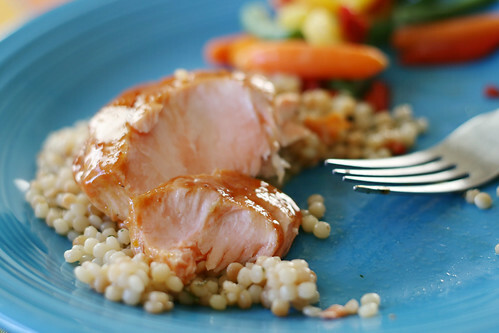 The salmon was moist and flaky and the glaze was sweet, slightly acidic and salty. So so good. I served it with a simple couscous cooked in chicken broth with just a little bit of parsley and oregano added at the end. Also, I’m not usually a fan of frozen vegetable medleys but I saw this Healthy Colors mix a few weeks ago and it wasn’t too bad. 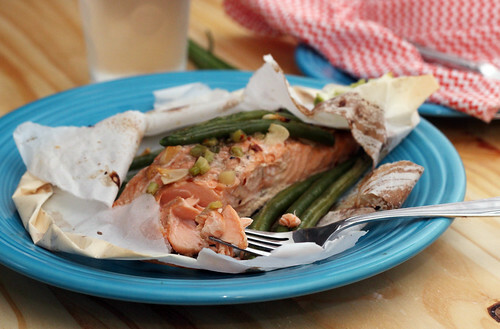 Though next time I think I’ll just stick with fresh green beans because the Salmon is the star of this meal. One last note, the original recipe called for 4 salmon fillets with this amount of glaze, trust me you’re going to want more than that (I got up mid meal to get just a little more). So if you make 4 fillets double the glaze and thank me later. In a small sauce pan, over high heat, combine the brown sugar, soy sauce, orange zest, pineapple juice and 1/4 teaspoon salt. Bring the mixture to a boil then reduce the heat to medium-low and simmer for 10 minutes. Set aside to cool and thicken a bit. Bake for 4 minutes. 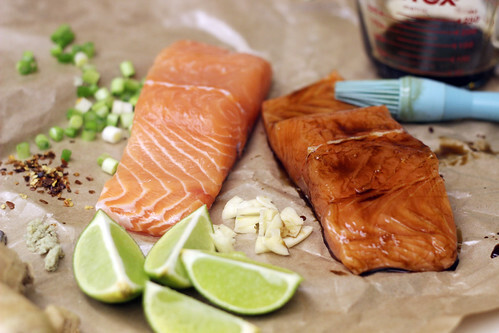 Remove from the oven and generously brush glaze over the tops of the salmon. Return to oven for 1-2 minutes or until the fish flakes easily. 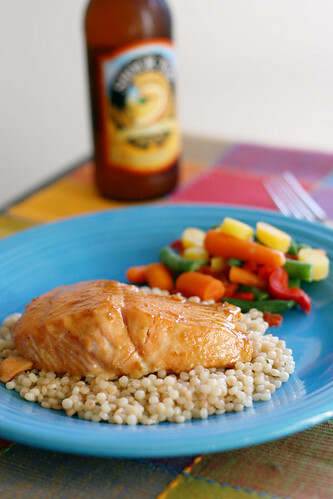 Serve with couscous or rice and a simple vegetable.